How to order your copy of The Handbook from the Library of Practical Geometry. The Library of Practical Geometry Handbook incorporates over 120-pages of step-by-step instructions to teach you how to create geometric constructions that are found in art, architecture and design fields. The Handbook is digitally printed on high-quality book-weight bond paper with a standard paperback cover. The book is wire-bound so it can lay flat when you are working through the diagrams. Each section is sub-divided and contains full-colour photos of interesting architecture, designs and patterns all of which are built on practical geometric principles. We’ve included a bibliography of 40 of the hundreds of books used a reference source in creating our handbook. Many of these books are hard to find and most are no longer in print – one reason why the application of these design principles is becoming a “lost art”. 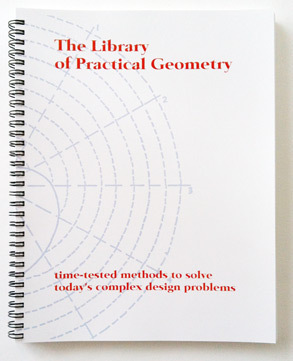 This handbook forms the foundation of the Library of Practical Geometry. Special interest sections which we call Subsidiary Collections are in development and are only available to customers who have purchased the Handbook.